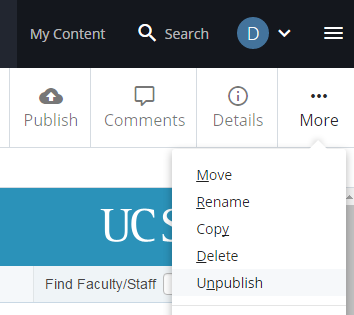 Find out how to unpublish pages, files and folders within the campus CMS. You can unpublish a page if it was accidentally published to delivery. If the page is no longer needed for the site, you should archive it instead. Staging is the preview or staging site. Uncheck this if you only want to remove the page from the live site, but still want to share the staging link. Delivery is the live site. If you want to make sure that the page is not published again, disable publishing. 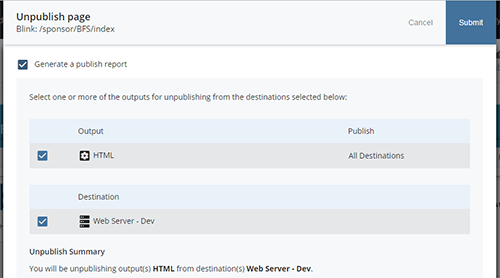 If the unpublished page is showing up in the left-navigation of its sibling pages on the live site, you will need to unpublish the page, disable publishing for that page and then republish the parent folder.